C-Line's long lasting; attractive polypropylene with built-in microban antimicrobial protection project folders will make your project extremely easy and organize. The strong, tear-resistant archival quality polypropylene folders are sealed on two sides with an easy loading and access system. Polypropylene material means there are no photocopy transfer giving the best protection for your hard work. The antimicrobial protection is great for preserving and protecting high-use materials that are handled by numerous of people. Reduced-glare finishes which will knock down glare for materials being viewed under moderate or bright lights. A unique corner design allows the folders to expand and hold up to 100 pages. ASTM testing certified product indicating this product will biodegrade in two to five years when buried in an anaerobic landfill. These report covers and project folders can help you work smarter! I deal with so many materials when preparing lessons. These folders help me organize them for effective use when teaching. Outstanding service and was surprised at how fast everything arrived. 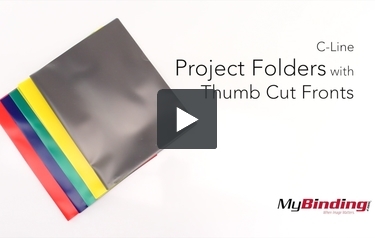 This is C-Line Project Folders with Thumb Cut Fronts! It’s a simple clear plastic folder you can place several sheets of paper into. And it has a convenient slit in the side to access your pages. It’s sealed at the bottom so you can easily transfer your pages without the need of a binding to hold them together. You can find them blue, red, gray, yellow, green and clear. You can place a lot of pages into this folder, but with more pages comes more likelihood of them falling out.